Enjoy the breathtaking views of the Chicago skyline and Lake Michigan while joing the the APWA-MN Chapter for a four-course dinner at Riva Restaurant at Navy Pier during APWA 2013 Congress. 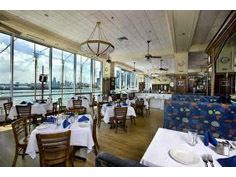 Riva is the only seafood restaurant on the waterfront and serves excellent Chicago seafood and steaks. The restaurant is within walking distance of the Congress hotels, as well as Millennium Park, the Magnificant Mile, and many other attractions. Please RSVP to Chapter Assistant Pat Schutrop with your payment of $50 per person by August 2, 2013. Download registration form (pdf). Please join us between 6:30 and 9:30 p.m. on Tuesday, August 27. The four-course meal is $50 per person, including appetizers, soup, main course, and dessert. A cash bar will also be available.